“…Once upon a time, there was a little girl named Goldilocks. She went for a walk in the forest. Pretty soon, she came upon a house. She knocked and, when no one answered, she walked right in. At the table in the kitchen, there were three bowls of porridge. Goldilocks was hungry. She tasted the porridge from the first bowl. Controlling center mass in stride. Before getting into the how to baseball stride drills guide, I want to preface that the PURPOSE of a stride shouldn’t be power. CLICK HERE for a Zepp swing experiment that may confirm this. If it’s power you seek, then I’d advise looking at the “Spring Loaded“ category. What purpose does a stride serve? A stride is for timing and initiating directional force. CLICK HERE for this post on that. Stride landing foot position to be about 65-degrees open (pointing perpendicular to home plate is zero-degrees, and straight at pitcher is 90-degrees). Chris says in the video that if a hitter is under or over striding, then they’re hampering body’s ability to create torque. Stride landing MUST align ball of the foot with ball of the foot. CLICK HERE for a post I did on how to fix “stepping in the bucket” using Reactive Neuromuscular Training (RNT). With the image to the right, it’s another one of my baseball stride drills using colored bands to fix stepping in bucket or crashing the plate. If the hitter is crashing too much with their stride, I get them to feel stepping out, and the reverse is true if they’re stepping out. I use variance to get them in the middle (blue band). Slide step – most Big League hitters use this. Aaron Judge, Robinson Cano, Joey Votto, and Andrew McCutchen just to name a few. 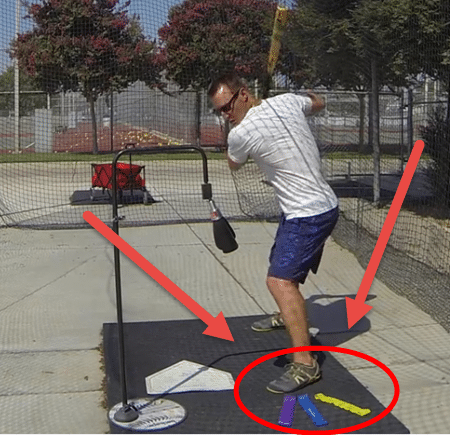 Toe-tap – I recommend this for my younger hitters. Troy Tulowitzki, Giancarlo Stanton, and Victor Martinez employ this. Of course, there are variations to these, but these are the three broad categories of stride types. I call the stride the ‘float’ and ‘fall’. The ‘float’ is a momentary shifting of weight back towards the catcher before falling forward. Matt Nokes calls this the ‘Ride’ and ‘Stride’. Some hitting coaches don’t like this idea, but the reality is this is human movement. The Chinese have been practicing exactly this move in Tai Chi for thousands of years…in stepping to my right, I have to make a brief weight shift to the left first. CLICK HERE for a post analyzing this dynamic move. There’s been few online Hitting Guru #57’s saying we want minimal to zero head movement when hitting. They claim, the more the head moves, the less your eyes see the ball. And they point to Barry Bonds as their champion. On paper, this conclusion looks great, and with Bonds as their poster child seems argument seems pretty reasonable. However, what science says and what the top 50 hitters in the Major Leagues are doing reveals something completely different. The opposite actually. Listen, I agree minimal to zero head movement when hitter’s stride foot lands. And if baseball stride drills are done correctly, this should be a natural result. But I don’t agree with minimal to zero head movement GETTING TO stride landing – BEFORE the turn starts. The biggest bomb NUKING minimal to zero head movement argument, is this 2013 article by Dan Farnsworth at FanGraphs.com titled, “Breaking Down the Swing: Best Hitters of 2012“. Farnsworth compiled a list of the top 50 hitters from the 2012 season according to Fangraph’s batting component of WAR (this is a big deal metric). Did you catch that?! Farnsworth revealed in his research of top-50 hitters in 2012, that ALL moved their head forward to some degree. You see, head movement is inevitable in ALL dynamic movement. Early is okay, late is not. Don’t sit there and point to hitting outliers like Barry Bonds, and tell me the top-50 hitters of 2012 all had it wrong. It was true then as it is now. Besides, did you know fresh out of the box, humans come with “video stabilizer” eye software? Ask an ophthalmologist. In addition, your knees, ankles (Achilles tendon), and hip joints act as shock absorbers too. If we start our hitters in an athletic position, and most importantly, they land in one, then the hitter will be fully optimized for minimizing the ball “speeding up”. Not too much, not too little, just right…Goldilocks Golden Rule. Center of Mass (COM) in the human body is located at the belly button. This was established in the womb. The umbilical cord is the center of an unborn child’s universe. I say this to demonstrate the importance of COM in controlling human movement. And remember the …Goldilocks Golden Rule. Great stuff as usual. There’s a reason why Ruth, Williams, Mantle (whose stride was too long), Mays, Aaron, and guys today like Donaldson, Harper, Judge, Sanchez, Betts, McCutcheon, to name a few, use one. Why take linear momentum out if the swing? Don’t forget about the Carnegie-Mellon study from the 1980s and the four different types of eye movements identified and explained in the study, among which was the vestibular-ocular eye movement, which is employed when a hitter is striding. Ground reaction force – more with a stride? More GRF = More Kinetic Energy travelling up the body? More Kinetic Energy = More Force eventually applied to the ball? Joe, I’m still not convinced GRF’s supply majority of power. Spinal Engine does that – 80% of it. However, interaction does help. I don’t disagree about the critical role of the spinal engine as your water polo example demonstrates. But in contrast to the no-stride approach, I think the stride creates more GRF and the leg kick/lift would create even more GRF. Thinking of Josh Donaldson in that regard. You go linear to rotational and rotational to linear…. and the dominoes go on forever…. If you have momentum, it’s easy change direction as opposed to a rounder boulder fixed into the ground… The stride gets your spinal engine moving and positioned to explode…. And if you have to adjust than it’s easier to go with the swing and adjust as needed than again in a standstill…. Power coming from the stride… Well power comes from many places but the core power comes from said core…Well if anybody thinks otherwise than they clearly don’t understand where power comes from and needs to educate themselves from how the body produces power…. When you play infield do you do a hop or lean foward during the pitch… Do you have too? The answer is “it’s easier”…. From the end of my load, It starts with the spinal engine… Notice I said the END of my load….